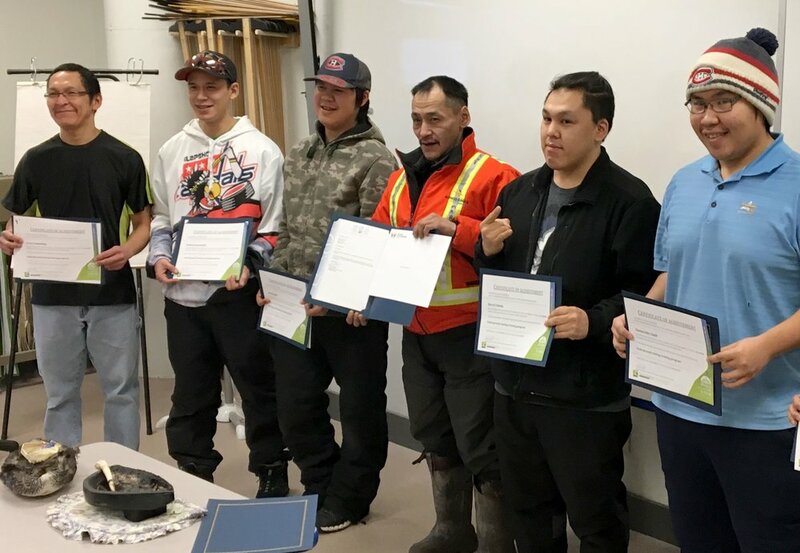 On Tuesday, December 4, 2018, the graduation ceremony for the Underground Mining Certificate Program took place in the Sanatuliqsarvik Trades Training Centre in Rankin Inlet. This made-in-Nunavut program was developed through a significant partnership between the Kivalliq Inuit Association, Agnico-Eagle Mines, Centre De Formation Professionelle College in Val d’Or Quebec, and Nunavut Arctic College. Albert Netser, Interim Chair, Trades and Technology of Nunavut Arctic College was the Master of Ceremonies and Mrs. Rosemary Sandy performed the lighting of the Qulliq and an opening Prayer. After completing the 14-week program, eight learners received their certificate by Matthew Ayres, Dean of Trades and Technology, who addressed the graduates and congratulated them on behalf of the College. All eight graduates have been offered jobs at Agnico Eagle Mines Ltd and Sarliaq Holdings Ltd.